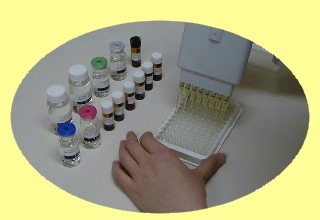 Lower concentration of 8-OHdG can be measured with this kit. "8-OHdG Check" is a competitive in vitro enzyme-linked immunosorbent assay for quantitative measurement of the oxidative DNA adducts 8-hydroxy-2'-deoxyguanosine (8-OHdG) in various biological samples such as DNA of tissue, serum, urine etc., using anti-8-OHdG monoclonal antibody. Differences between "New 8-OHdG Check" and "Highly Sensitive 8-OHdG Check"